Author: David Williams at the Mullard Space Science Lab. Over recent years, we’ve come to appreciate just how much filament eruptions are part of the phenomenon of a coronal mass ejection [1,2]. Very often, the relatively dense core of a CME is made up of the remnants of material in the original filament, and twisted or sheared magnetic fields that are thought to support a filament against gravity are very likely involved in much of the twisted field seen in CME structures. It’s also pretty likely that rearrangement of magnetic field is an important process in these eruptions, so it’s a good place to go looking for signs of reconnection. even if you could, the lead time would have to be about the typical length of a satellite’s observation schedule (usually one to several days). All in all, it’s a bit like using binoculars to watch a football match: they’re incredibly powerful looking where they do… but you won’t catch all the action. So we really sat up and took notice when EIS did measure an eruption last year. EIS’s slit was lying outside the solar disc, above an active region, when one of the most celebrated filament eruptions of the SDO era (see Figure 1, and you might recognise it) went hurtling past. The spectra we got were made from minute-long exposures, tailored to measuring the diffuse off-limb corona. This meant that EIS was sensitive to faint features, which turned out to be pretty lucky for what we show in this nugget. 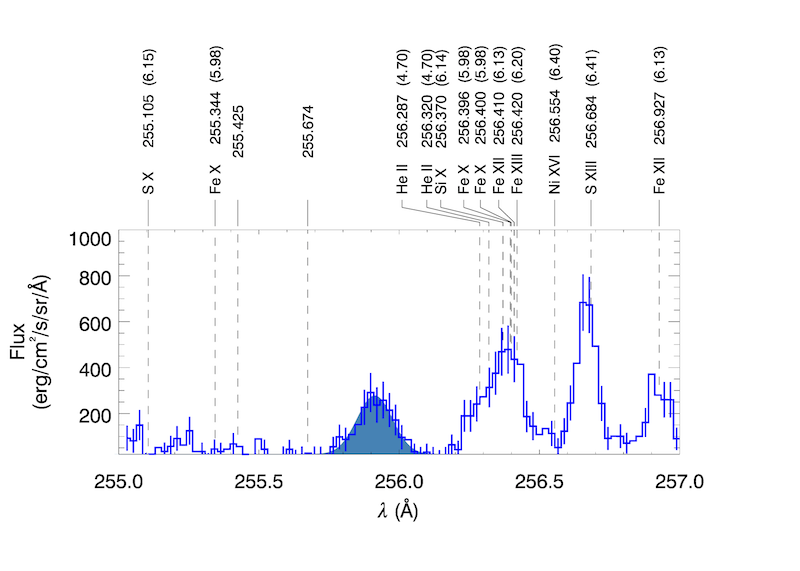 Figure 2: EIS spectrum around the Fe XII line at 195.12 Å. The smooth shaded curves are fits of two Gaussian profiles to the data. 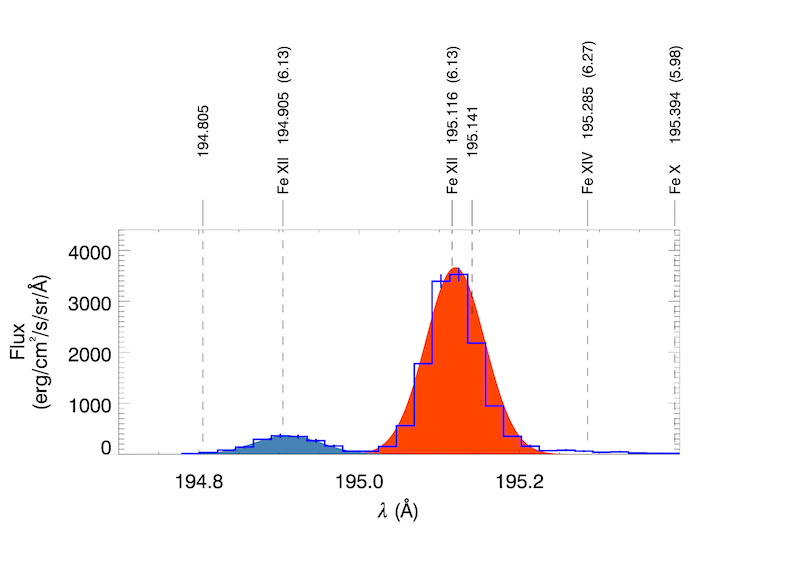 This emission line shows up as two components: one at rest (larger orange Gaussian) due to the background/foreground corona; and one blue-shifted to the left (smaller, blue Gaussian) by -310 km/s. The measurement of this Doppler shift, shown in Figure 1, indicates that it comes mostly from just to the side of the filament. The strong EUV lines of Fe XII (193, 195 Å) and He II (304 Å) have been used to great effect by SOHO/EIT, TRACE, and SDO/AIA to observe the corona. But EIS also observes the same two ions spectroscopically: He II 256.32 Å and Fe XII 195.12 Å are “core” spectral lines, which appear in nearly every EIS observation. Using AIA with EIS, we get all the action from the wider picture, practically all the time, and have a great combination of datasets that gives us a view in three dimensions (two spatial, one spectral). That combination is particularly useful in analysing highly dynamic events like this. Figures 2 & 3 show spectra from the eruption taken at 19:51:07, shown in Figure 1, just north of the dark filament leg. The long exposures bring out a faint Doppler-shifted component of the 195.12 Å line, blue-shifted by around 310 km/s from the main, rest component. Similarly, in the He II window, we can see a blue-shifted component of emission moving at more than 370 km/s towards Earth. Figure 3: EIS spectrum in the wavelength range around He II 256.32 Å, taken at the same place as Figure 2. The annotations at the top show the wavelength of lines previously identified in the off-limb corona  and prominences . The complex of lines around He II is not fitted as a single component, due to their blending. However, the single shaded (blue) Gaussian shows a fainter, blue-shifted component of He II 256.32, displaced by -370 km/s. Along the full 512″ of the EIS slit, we only detect these blue-shifts just beside the cooler filament material, as EIS scans across it (as shown in Figure 1). This blue-shifted component persists for at least 10 minutes, and represents the intersection of a bright “thread” of emission that runs along the whole filament as it erupts. This thread is also rooted in (or very close to) the eastern flare ribbon, suggesting that it’s near a topological boundary of the erupting structure (e.g. possibly a quasi-separatrix layer  between an erupting magnetic flux rope and the surrounding field). Although the line-of-sight velocities measured by Doppler shift aren’t particularly high in Alfvén-speed terms, in sound-speed terms they corresponds to some pretty high temperatures (between 5.5 and 8.0 MK). If the bright thread doesn’t get that hot, then these speeds are supersonic. It’s also worth noting that “lumps” of bright plasma move up along the thread towards the apex, perhaps indicating a velocity shear instability like that seen in CMEs with AIA [6,7]. The fact that there is plane-of-sky motion like this along the thread means that full velocity is likely to be much higher than just the Doppler-shift measurements, perhaps comparable with the rise speed of the eruption’s apex (between 300 and 600 km/s where AIA can still track it). Furthermore, this bright thread also bears some topological resemblance to the “stem” of material noted in the CME analysed by [6,7] (see “pixel 2” in ). It’s interesting that their stem was found to be hot (8 – 15 MK), so perhaps the speeds we measure aren’t locally supersonic after all. Whatever it is, there needs to be enough emission measure there for us to see the thread, and a strand of filament might just supply the required mass. Perhaps it has become caught up in the magnetic field that is reconnected as part of an ongoing process around the erupting structure, leading to significant heating of the once cool material, and generating visible, high-speed flows in the process. A rare EIS observation of a filament eruption has thrown up more than a few questions about its fine-structure dynamics, and the new Doppler-shift observations reveal a very fast flow of plasma in a thin structure near the remaining cool material. It may be that a strand of dense material from the original filament has become caught up in the mêlée of rearranging magnetic fields, and has illuminated for us a part of the large-scale reconnection process around a CME.